Didnt JMDL give one of these away not too long ago in a contest?? I did have the only known carded Muggsy Liftsome for a few months this summer, until everyone else got theirs. Rarest legit car is probably the Petrov Oilski 3-Car gift set from Kohl's. I have never seen or heard of another. Rarest back-door/customs are chrome plated Kabuto with flames, gold-chrome plated The King, chrome plated LMQ, Motorama LMQ and unpainted Gasprin body probably. Yes, they did. One of the few times I've ever used facebook. I had to use my wife's account to enter the contest. Last edited by Clearysdad19; 02-20-2014, 11:22 PM. My prized possessions I have are. I want to say my mater with the cone teeth and filmore with the oil cans. I have them both packed away in storage right now. If I can find it in the storage bin I'll take a picture of it and post it. 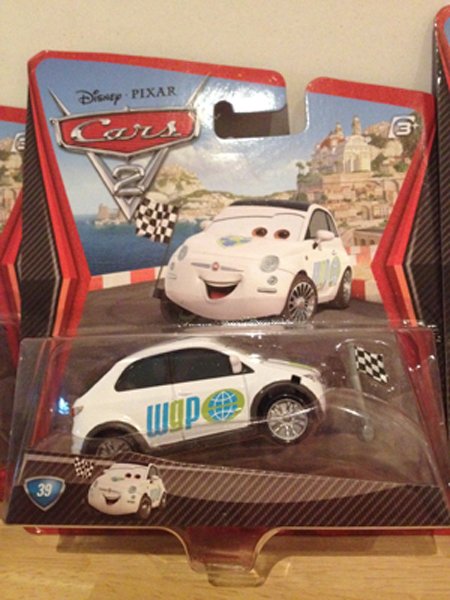 A version of Mater that was scheduled to be released as a Deluxe towards the end of 2010-early 2011, but never was. I imagine he's mistaken it for Mater w/ Oil Cans or Mater w/ Ghostlight Lamp, unless he was the only person in America to have found one carded. I think that's just an error with the front decal missing. Speedway of the south. Mamma got it for me when it was released.